Isn’t it great? This photograph is one of ten chosen by Wired magazine photographers as their favourites of the past year. It was the accompanying photo for an article I read over thanksgiving weekend in a mountaintop cabin, dealing with cloned cattle and the benefits of cloning for that purpose (oh, and the strong probability that we’ve all eaten cloned meat already). 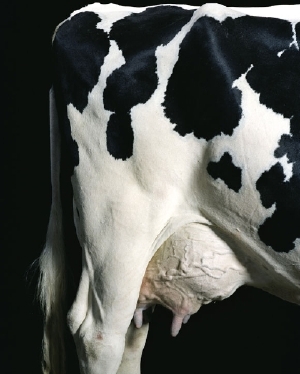 I love the huge, healthy, heaving, multi-gallon udder. Moreover, I never imagined I’d be writing that sentence. Click here or on the photograph to see all ten top Wired photos of 2007.